Compact size 4-channel mixing console, lightweight and portable, suitable for home karaoke, network live broadcast, music recording, etc. 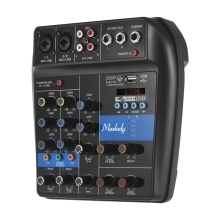 With 2 MIC/LINE (TRS & XLR 2-in-1) input jacks for connecting microphones, musical instruments or other audio devices, which supports mono/stereo switch. 2 groups of RCA outputs (L & R) to connect external recorder; 2 TRS stereo outputs(L & R) to connect speaker or amplifier; 1 TRS PHONE output to connect headphones. With GAIN，HIGH frequency, LOW frequency, LEVEL control knobs, allowing you to modulate more excellent sound effects. Other features: +48V phantom power for condenser microphone; With USB interface for connecting MP3 player, also supports connecting with your smartphone via BT.